Jan Devereux, an incumbent running for her second term, has lived in Cambridge since 1993. She was the only non-incumbent elected as councillor in 2015. 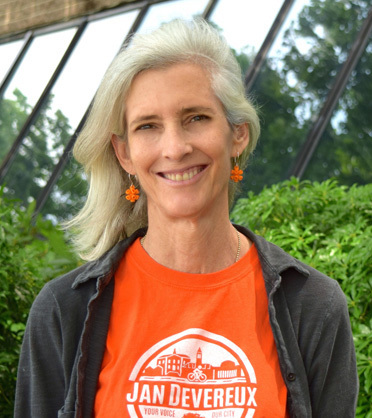 Jan Devereux, an incumbent running for her second term, has lived in Cambridge since 1993. She was the only non-incumbent elected as councillor in 2015, and currently serves as the chair of the Health & Environment Committee, as well as the Economic Development & University Relations Committee. Her campaign this year draws attention to sustainable urban development and increasing engagement between government officials and their constituents. She was recently endorsed by the Cambridge Residents Alliance and Our Revolution, a political action group spearheaded by Bernie Sanders. Raised in Florida, she received her BA in English and MBA in Marketing from Princeton and Columbia, respectively. Later, Devereux worked for over ten years in communications and external relationships for school districts, including the Community Charter School of Cambridge. She also led her to co-found the Fresh Pond Alliance, where she formerly served as president. THE HARVARD CRIMSON: What do you think are the biggest issues facing Cambridge right now? JAN DEVEREUX: Housing and general affordability, not just in housing but in cost of living, is a huge concern because—like every part of the country and in metro areas—we have huge and widening inequality. The cost of land is very expensive in Cambridge, therefore the cost of what we build on that land is increasingly expensive, and the demand is increasing. Another challenge we face as policy makers is how to balance. The growth is inevitable and the growth brings many good things, but the growth also puts a lot of stresses on the community. Not just on the people, but the services, infrastructure, and the environment. So I think planning and continuing to really talk is what will be focused on for at least the next term, probably the next 20 to 30 years. But for now it’s all ‘go, go, go’ and Cambridge is struggling to figure out what the community mitigation should be. We’ve been holding zoning meetings about the Volpe rezoning. It’s a huge project. It’s something Cambridge has wanted for decades...They’re talking about making a community center. They’re talking about a job connector. At this point we’re still negotiating those. As well as making sure there’s graduate housing, which will help create and open up even more housing across the city. But at the same time they’re asking for huge upzoning, a lot of density, and we want to make sure the community is getting the best deal possible. So we’ve been talking about everything from the amount of affordable housing to the balance of commercial and residential. We’ve also talked about whether MIT can convert any of these from market use to educational use, which would take it off the tax rolls. THC: Where do you stand on the preservation of Harvard’s historical architecture? JD: Maintaining the historical and cultural and architectural character of a city is so important, and if we lose that we lose a lot, so yes obviously I think we should. Obviously the Abbot Building has raised some alarm over that, as has the kiosk. I know in other neighborhoods people want to buy historical houses and replace them with something more contemporary. But I think that will always be a source of debate, but I know there is a new task force to review the Harvard Square conservation district guidelines, and hopefully strengthen the guidelines in the process. THC: How do you think Cambridge should balance the need for bike infrastructure with existing transportation needs? JD: I think all safe street and Vision Zero advocates would say there are three pillars that you need to build on. Engineering, which is how you build safe lanes, like on an existing street or with just paint and plastic, like Brattle Street. There is education, which is educating everybody, including those on bikes about what they need to follow, drivers about how to avoid hitting people and opening doors, and pedestrians in changing how we see the road. When you’re behind the car, you see the road differently than you do on a bike, so we need to be conscious of the other people at all times. We need to be thinking, as a driver, what pedestrians are doing and vice versa. We are seeing downturn in single occupancy driving vehicles, and the future is going that way too. We’re close to driverless cars, and people are biking more. What would really help is the state making a bigger investment in transit infrastructure. Hopefully people won’t feel stuck having to drive everywhere. Our streets just aren’t big enough for the number of cars on them, and it can increase still. THC:Do you think that the City Council has done enough to respond to Trump? JD: I know a number of candidates have said in forums that the very reason they’re running for office is because of Donald Trump. I think it has woken up a lot of people and hopefully a greater number of people will turn out to vote in the local election and do their research, attend forums, and make an informed choice. I don’t think many people running, or in Cambridge really, who aren’t against Donald Trump, so I think continuing to pass what are mostly symbolic resolutions doesn’t do much. In terms of what we can do, we can continue to express everything from opposition to disgust to many of his policies and how he conducts himself. It’s appalling, I think, but I just don’t know if we can, as a body, do much. We can’t solve the healthcare problem, but we can be aggressive in our own approach to climate change and remaining a sanctuary city and protecting undocumented immigrants. I think some people have decided that, since they feel relatively powerless under this federal administration, I think it’s good to focus on the local because at least they feel they can have an impact. I hope people are organizing a strong resistance to put forward candidates who can take back important offices in congress and the White House. If anyone has an interest in being involved in any way, there’s plenty of opportunity now. Hopefully after this campaign, people will shift their energy to the national level.